Galerie m Bochum is featuring in its long gallery new pictures by Thomas Florschuetz (b. 1957 in Zwickau/Saxony). With these very recent photographs, the Berlin-based artist continues his exploration of modernist architecture, which began in 2001 with his images of Mies van der Rohe’s German Pavilion in Barcelona. In his serial works devoted to various groups of motifs, whether his own body, everyday objects, flowers or fruits, airplanes or buildings, Florschuetz crafts compelling images whose tension-laden compositions operate as graphical configurations while at the same time exerting a visceral pull. Picture elements loom into view as volumetric bodies with diverse forms and material qualities. Florschuetz sometimes shows his subjects from only minimally divergent perspectives, making the overlapping and nesting of planes and spaces, the play of light and shadow across surfaces, the springboard for his distinctive image cosmos. Our view of the subject is fragmented, cropped, and yet Florschuetz creates from these excerpts balanced pictures whose fragments always serve the dictates of the composition. The four works on display show the Museo de Arte Moderna in Rio de Janeiro, built in 1954 by Affonso Eduardo Reidy, who, along with Oscar Niemeyer, Lúcio Costa and Lina Bo Bardi, counts among Brazil’s foremost modernist architects. The views of the building, zeroing in on selected details, for the most part prevent the viewer from taking in the structure as a whole. Instead, they convey a photographically concrete idea of what the depicted building might look like. 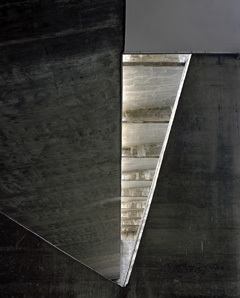 The plunging diagonal lines and the rough-looking surfaces and forms of the exposed concrete thus conjure abstract compositions that only look as though they are emancipating themselves from the underlying architecture. In Florschuetz’s pictures, both the building’s physical presence and the geometrical clarity of its lines remain keenly palpable.